How To Do Keyword Research In 6 Steps | Bruce Clay, Inc.
Search Marketing » Bruce Clay, Inc. Blog » How To Do Keyword Research In 6 Steps | Bruce Clay, Inc.
Everything covered in this article you can do at a basic level with Google.com and the Google AdWords Keyword Planner. Paid tools like WordTracker and the Bruce Clay, Inc. SEOToolSet® offer more advanced keyword insights like in-depth competitive analysis, and search insights for the Bing and Yahoo! engines, as well as Google. While physically you can enter the words from your brainstorm list into your keyword tool one at a time or all at once (the Keyword Planner lets you enter up to 10,000 keywords), I recommend entering your words in small batches of 10-12 related phrases as it will make parsing through related keyword phrases (called “Keyword ideas” in the Google Keyword Planner) much easier. When using the Google Keyword Planner you will see three search options on the tool home page: search for keyword ideas; enter or upload keywords to see how they perform; and multiply keyword lists. You can do everything discussed in this blog post using the first option, search for keyword and ad group ideas. This option will automatically return Exact match search results and keyword suggestions that tell you how many people searched for your phrase exactly as you entered it. Nearly every keyword research tool will return suggested keyword phrases that are similar to your original phrase request. 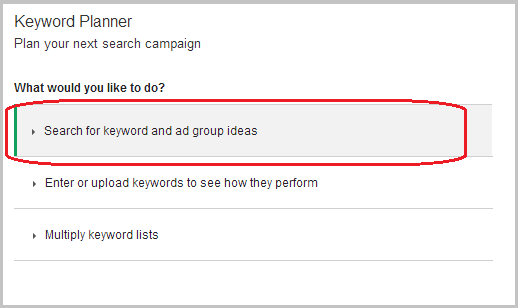 As mentioned, in the Google Keyword Planner these are called Keyword ideas. Since the first priority of the Keyword Planner is to support Google ads, the tool will return your results organized into two tabs: Ad group ideas, and Keyword ideas. Ad group ideas will automatically load first. To see a full list of keyword ideas organized by monthly average searches, click on the Keywords ideas tab. Gleaning insights from suggested keywords is truly invaluable as it allows you to understand the exact language your target demographic is using to search for your products. This information can help you build and refine your target keyword list, as well as your product and content road maps (read more about why SEOs use keyword phrases, including why they help marketers develop content and product strategies). In this image we see the Keywords ideas tab selected and a list of related keyword ideas circled in red. Pillar Five: How Many People Ask For It Like This? 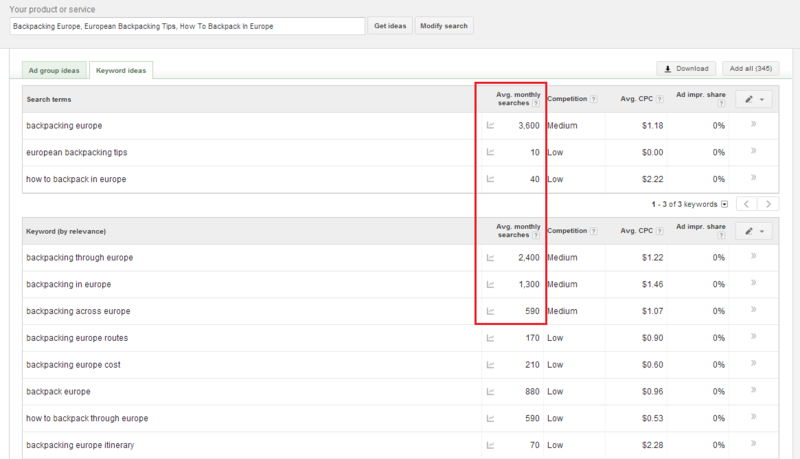 Looking at the Average Monthly Searches of a keyword phrase will tell you how many times per month an exact keyword phrase was entered into a Google search. Some tools like the Google Keyword Planner will only tell you how many times the term was searched in Google; other tools like the SEOToolSet® will tell you how many times the term was searched in Google, Yahoo! and Bing. 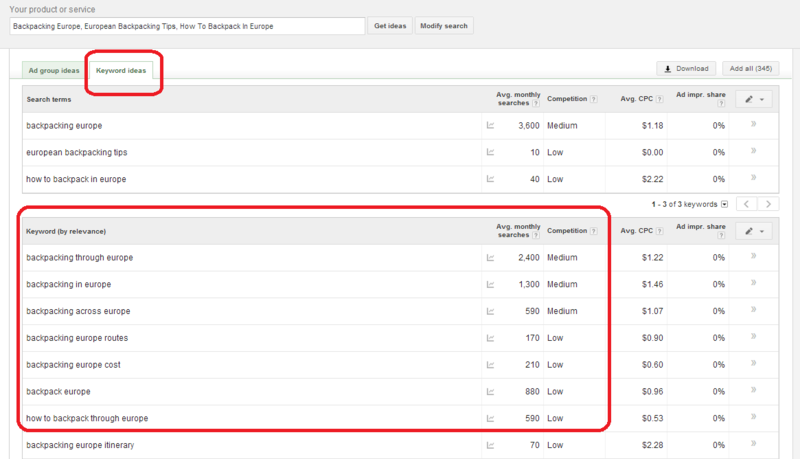 Look at the Average Monthly Searches column in the Keyword Planner. There is not a catch-all magic number that represents the perfect search volume. What constitutes the “right” search volume is going to be different from brand to brand, and objective to objective. That said, whenever possible try to use the Keyword ideas section to find words that are the best of both worlds — very specific long-tail keyword phrases with high search volume. For instance, in the example below we’d want to use “Backpacking Europe” — a phrase with 3,600 monthly searches — rather than the very similar phrase “How to Backpack in Europe,” which only has 40 local monthly searches. Pillar Six: Competitive Analysis — Does This Search Phrase Mean What I Think It Means? TIP: See our free tutorial on search engine optimization for step-by-step help with keyword research plus 17 other topics! Thanks for the great information. Keyword Research can be overwhelming at times and your blog helps to put it all in perspective. I think that keyword research and high-quality content creation should definitely work hand-in-hand, and, as you pointed out, it’s essential that you never have the former without a plan to also have the latter. Keyword research is all about figuring out what people want and how they are asking for it so that you can be in the right place at the right time with the right content. 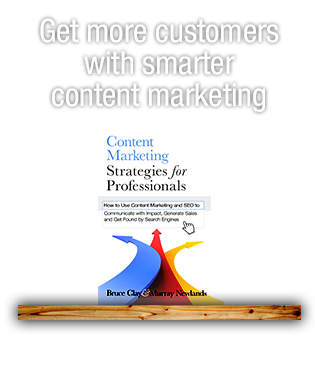 The last part of that equation — having the right content — is really critical. You want to use keyword research to identify need and drive traffic, but, as you mentioned, driving traffic to poor content won’t result in a win for anyone. I’m totally with you on this. In your comment you mention that you believe “putting out better content is more important” than keyword research — I like the ‘if you build it they will come’ approach, and sometimes it does work, but I do think it’s important to remember that when it comes to the SERP top 10 we’re truly in a game of inches with our competitors. And, as such, I think strong content and keyword research ultimately need to work together — rather than deeming one more important than the other. While ‘if you build it they will come’ may work if you are the only one who’s ever written about a topic, if you are writing about topics that lots of people are searching for chances are you are not the only one who has ever written about the topic, which means chances are also good that you have lots of competitors who believe their blue link is worthy of spots one, two, or three on page one. Having long-tail keyword phrases included in your articles and in your Meta (IE: The places where Google looks for relevance clues) may just be the small signals Google needs to determine that your article is more relevant — and, accordingly, more worthy of positions one, two, and three — for a high-volume search query. Great addition to the conversation, Kurt! Nice Guide, Doing keyword analysis is really important. I have found that it is little easier to rank if your blog is themed for a specific niche or keywords. SEO’s give preference if you have other related contents also on your blog!! I have seen many times in my experience that most of the times researching keywords that are not appropriate to your website makes you fall down in Google. So for getting rank up in any search engine, keyword research is the important thing that matters. Many times all newbies forget about Keyword researching.I’ll say that first choose a good keyword to your blog or site by using Google keyword researching tool then start blogging or run your site. Everything is depend on keyword research because if you choose a bad keyword to your blog then you should not get success. So, Its important not only important it’s too important. Chelsea Adams – You may have written this article to all newbies, however this article should also all Seo workers and lovers :) Really helpful and nice aricle. Thanks for sharing your knowledge. 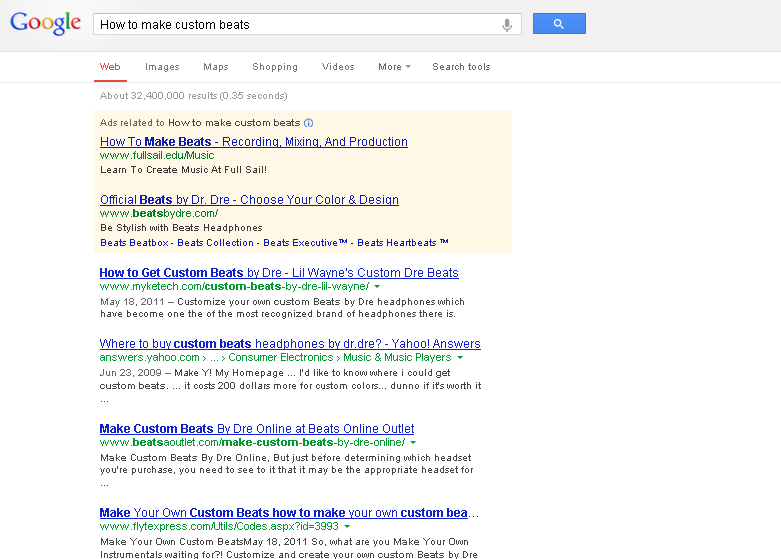 I always prefer Google Adwords tool for keyword research. I never used Market Samurai or any other. Google Adwords provide a faid idea about competition and hits Local and Global. It’s important not to rush through the keyword research process. There’s a lot involved if you want to do it well, as outlined in your post! Too many website owners think that they know what keywords to use since they “know their business” but sometimes as a website owner you are just too close to it and can miss the mark with targeted keywords. Glad you found the article helpful and easy to consume. “SERP” is an acronym for “search engine results pages”–or, the options that Bing or Google return to you after you do a search. There are a lot of acronyms that search optimizers use on a daily basis (SEO, SERP, PPC, CPC, CRO, CTA to name just a few off the top of my head…); thanks for reminding me that not everyone speaks in acronyms! 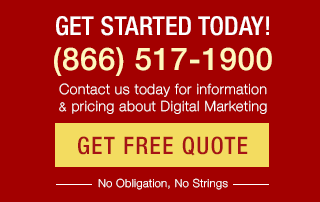 Let me know if you have any questions in the process of your website build. We’re always looking for new blog article topics and I’d love to help out as I can. I am in the middle of creating a new website. Your article was very helpful. I appreciate the fact that you wrote it without a lot of jargon (except for the term ‘SERP’???) so anyone can understand it. Thanks for reading, Robert. I also have SEO Quake installed and find it to be very helpful. I’ve moved heavily into affiliate marketing recently so I’m doing a lot of keyword research. There’s a lot of good stuff in your post that I wasn’t aware of, so many thanks for that. 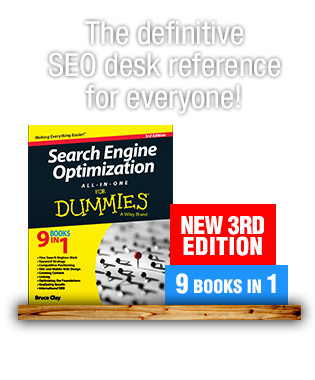 One tool you didn’t mention that I have found very useful is SEO Quake. That runs as a free add-on in Firefox and provides a lot of analytical information. Think it also runs in Chrome.